Trees are an important element to your backyard landscape. Not only do trees provide much-needed shade in our increasingly urban suburbia, but their lush, green foliage adds amazing aesthetics. But sometimes our common backyard trees can fall victim to unforeseeable natural threats, which can weaken and eventually kill them. Here, we’ll review the most common threats to trees and how you can protect your trees from damage. Tiny insects and animals are one of the biggest threats to tree health and foliage. The tree in your backyard may seem like it’s perfectly healthy at first glance, but only a careful look can tell whether it has been infested by pests like beetles or carpenter ants. Over time, these small insects can burrow into the trees, build their nests and lay eggs, effectively weakening it from the roots. This can pose a major threat to your home if the tree becomes unhealthy enough to fall. See this document from the U.S. Forest Service on the 70 most common insects and 27 most common diseases that threaten trees in North America. One of the most common threats to trees and landscape plants is lack of nutrients. This can manifest in various forms, from discolored foliage to variations in the size and shape of the leaves, to stunted growth. One should be cautioned to not simply dump pounds of fertilizer – organic or otherwise – at the base of your tree if you believe there is a soil nutrient deficiency, as only a soil test can reveal the specific problem. First, identify what nutrient/s the tree is lacking and then add only that nutrient. As a rule of thumb, annual feedings of compost are usually sufficient if there is not a specific soil problem. One should also note that lawn feedings by lawn services may affect the nutrient levels available to your trees and throw the balance off due to the large amounts of fertilizer these services use. The University of Maryland has an excellent fact sheet on identifying nutrient deficiencies in trees. Just like human beings, trees are vulnerable to diseases, especially if they grow up in unfavorable conditions. The key to a thriving backyard landscape is to make sure that your trees are getting proper light, air circulation, nutrients, and water. If not, they can be vulnerable to diseases which can manifest in the form of fungi, bacteria, root and stem rots, etc. These diseases can cause infected leaves and weak roots. Moreover, the trees that are susceptible to root diseases can quickly become infested with insects like the bark beetle or wood borer. Before treating any insect or disease in your trees, identify the problem and choose the appropriate treatment. Using organic or manmade pesticides at random is always a bad idea. 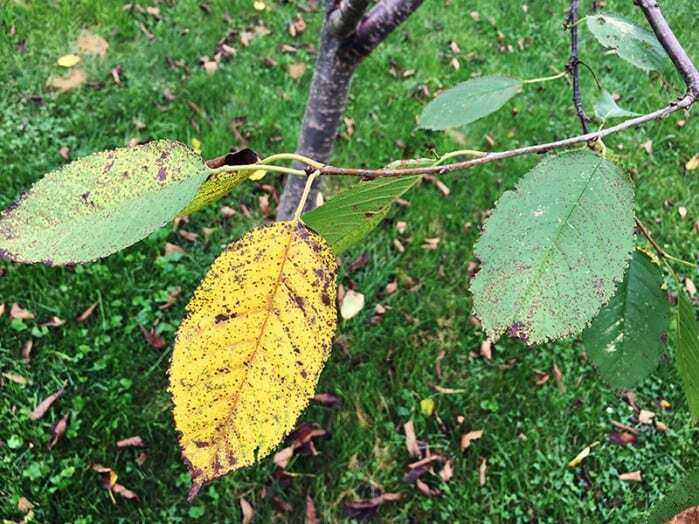 A young cherry tree with a fungal infection defoliates in late summer. It’s fun to experiment with new plants in your landscape, but it’s important to make sure that what you plant is as non-invasive to the existing flora and trees as possible. Non-native species that are introduced into any forest, landscape, or gardening eco-system can become a huge problem in the long run. Their genetic material can have an enormous impact on biodiversity, which can make them invasive to the existing trees later. This can also threaten other local native species outside of your landscape and in some cases endanger them. When you plant a tree in your backyard, the roots need room to spread out. This can be difficult when planting in compacted soil and heavy clay. Poor quality, compacted soil is an especially common problem if your home has been recently built, as many contractors use construction fill – soil scraped from other sites which may include debris – to shape the landscape. If the tree’s roots have no room to grow and face constant soil pressure, the result may be crushed roots, poor water and nutrient uptake, and stunted growth. You can counter this threat by using best practice planting methods along with vertical mulching or mixing in organic matter into the compacted soil. The Morton Arboretum has an excellent video primer on planting trees. External injuries inflicted on a tree by mechanical or natural means can be a huge threat to its health. You may accidentally end up ramming a lawnmower into the bark or damage it with a string trimmer, small fauna like rabbits can nibble away at the bark, or severe storms may sever limbs. All of these things can threaten the tree’s health, which in turn affects the water and nutrient uptake of the tree. You can guard against landscaping and rodent damages by wrapping the tree with protective materials like Jobe’s Tree Wrap. These are some of the most common threats to your trees that unexpectedly cut their lives short. Some are natural, while others are human, but you can always try and do your best to take care of them all. Mark Nasic is a member of Tree Barber team and is on a mission to spread his love for nature. When he’s not at work saving old trees and helping the growth of young saplings, he enjoys taking walks with his two dogs, Fred and Wilma.